Replacement leads for Gardner Bender meters GMT-12A, GMT-18A. UL recognized. Tough ABS Plastic. Flexible cords for easy use. Tests AC/DC voltage from 5-50 volt. Glows when voltage is present and brightens as voltage increases. Insulated alligator clip tests leads. UL Listed. Carded. For testing electric circuits from 90 to 600 volt. Detects presence of power on either AC or DC circuits. Identifies circuit conductors. Klein Tools RT110 Receptacle Tester detects the most common wiring problems in standard receptacles. Conditions indicated: wiring correct, open ground, reverse polarity, open hot, open neutral, hot/ground reversed. Conditions not indicated: quality of ground, multiple hot wires, combinations of defects, reversal of grounded and grounding conductors. Cuts and strip wires, crimps ignition terminals. Easy-to-read wire size markings. Includes spring return and lock. Adjustable, hardened spring steel. Strips 10-24 gauge wire. GB Cable Ripper, Premium, 14 - 6 AWG Cable/Wire, 4 in Overall Length, cULus Listed, For Use to Cut Off Cable Jacket Large, dual, neon indicators acknowledge presence of voltage. Individual indicators for each voltage range assures reliability of testing. Probes snap on bottom of housing for single hand testing of outlets. Insulated leads and housing. Tests from 100 to 300 volt AC/DC. UL Listed. Three-way live circuit tester indicates 120, 240 and 277 volt AC. UL Listed. Tests ground fault breakers by overloading circuit and tripping GFCI. Plug tester into any ground fault receptacle (110-125 volt AC) and press black button to overload circuit. Tests for seven conditions; ground fault interruption, open ground, open neutral, open hot, hot/ground reverse, hot/neutral reverse and correct wiring. Yellow and red lights provide indication of circuit status or specify which wire is defective. Carded. Tests for breaks in non-energized wires or cords. 360 degree visual indication. Durable, heavy-duty tip. Flexible lead with insulated alligator clip. Pocket clip. Operates from 2 AAA batteries (included). Compact ergonomic design. Hi-impact ABS housing. Visual voltage indication. Snap-in leads are spaced to fit a standard outlet for easy, hands-free testing. Tests for voltage at 120 volt, 240 volt, 277 volt and 480 volt. With pocket clip. cULus Listed. 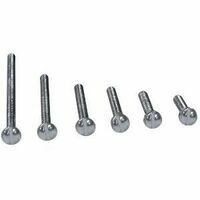 GB Screw Kit, Electrician's, 120 Pieces, Includes: (20) 2/3 in, (20) 7/8 in, (20) 1 in, (20) 1-1/4 in, (20) 1-5/8 in and (20) 2 in Phillips Head Screws, NO 8-32 Phillips Round Head, For Switches, Receptacles and Outlet Applications Contains assorted sizes and lengths of commonly used electrical screws. Screws are #6 - 32, ranging from 3/4" to 3" in length. Tapered nose allows cutting in tight locations. Dual cutting edge and high-leverage comfort grip handle design for optimal cutting performance. Precision-machined and induction-hardened knives strengthen cutters and provide consistent performance when cutting aluminum, copper and medium-hard steel wire.